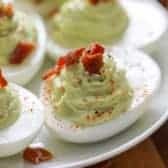 A delicious twist on deviled eggs! Avocado Deviled Eggs combine our favorite classic deviled eggs recipe with the creamy goodness of avocado! These eggs have a delicious avocado flavor only made better with…. you guessed it… bacon! This easy favorite is the perfect addition to any picnic or potluck! Should you be lucky enough to have leftovers, mash ’em up to make Avocado Egg Salad for lunches! Looking for a low carb avocado deviled eggs recipe? I’ve got you covered, this recipe takes deviled eggs to a whole new and healthy level! Elegant and colorful, these avocado deviled eggs with bacon are a ‘good’ fat and makes a deliciously creamy filling combined with egg yolks, mayo and a splash of lemon/lime juice! If you’ve never tried an avocado egg recipe, this one is sure to be a favorite all year round! What is Deviled Food? “Deviled” in food terminology simply means food prepared with spicy condiments/seasonings (like mustard). The term was coined back in the 18th century in Rome and has endured ever since and we’ve been enjoying both ‘deviled’ are ham and eggs for as long as I can remember! You’ll want to start with perfect hard boiled eggs (you can also make eggs in the Instant Pot if you’d prefer). Cool the eggs completely for this recipe. Cut hard boiled eggs in half and remove the yolks. Mash up the yolks with a ripe avocado and some seasonings (I add lemon or lime juice to keep the filling from browning). Scoop or pipe into egg white halves. We use a sandwich baggie with the corner cut off. Finally garnish with some cooked and crumbled bacon and a sprinkle of paprika for color. 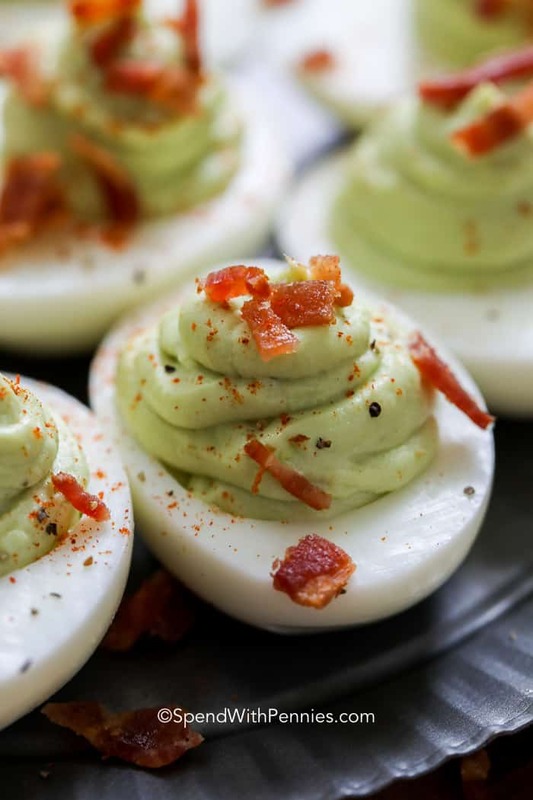 Want to really ‘devil up’ your avocado deviled eggs with bacon? Try adding a teaspoon of Sriracha to the mixture for an extra spicy flavor! 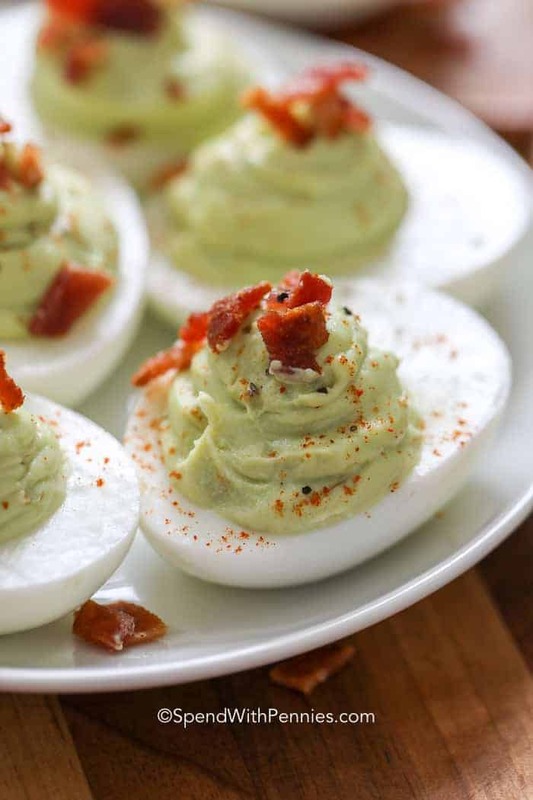 Or even try a bit of salad dressing to make creamy avocado bacon ranch deviled eggs! Go ahead and get devilishly creative! Avocado deviled eggs taste best when they are freshly made and cold! They can be fully prepared a couple of hours in advance. If you want to make them ahead of time prep everything as directed except the avocado. Shortly before serving, mash the avocado and stir it into the mashed yolks. Fill the eggs and serve. How Long are Deviled Eggs Good For? Regular deviled eggs are fine for up to 5 days. Unfortunately the avocado in these eggs doesn’t last quite as long. They’ll still be food-safe to eat but the avocado can oxidize so I try to eat them within a couple of days. If you’ve got leftovers to use up, try an egg salad for lunch or chop them up and add them to your fave pasta salad recipe! Best Egg Salad Recipe – Classic egg salad is a favorite! Dill Pickle Deviled Eggs – So yum. Denver Egg Casserole – Great for dinner too! Make Ahead Egg Muffins – Make ahead for weekend breakfasts! Ham & Spinach Frittata – Easy breakfast! Avocado Deviled Eggs combine our favorite side dish with the creamy goodness of avocados! Cut eggs in half and remove the yolks. Mash together the yolks, avocado, mayonnaise, juice and seasonings until smooth and creamy. 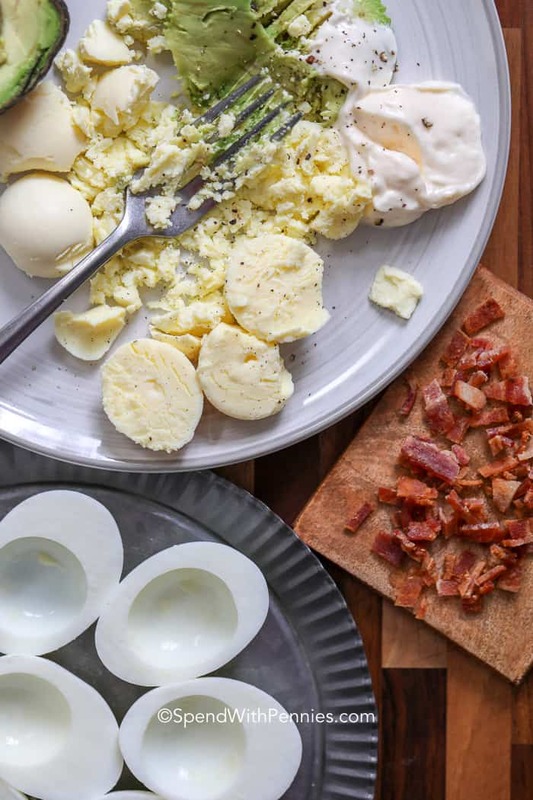 Pipe into egg whites and top with crumbled bacon and paprika. Next PostNext Delicious Cauliflower Salad with a Crunch!